The annual Discovery Algoa FM Big Walk sees many people from all over South Africa coming to take part in the event. These walkers participate in the event for a number of reasons, ranging from making changes from an unhealthy lifestyle to a healthier, active lifestyle and to support a charity and make a difference. One of these causes in this year’s Discovery Algoa FM Big Walk which walkers supported centred on cancer. Many walkers took part in the event to show support to their loved ones battling cancer, or, as cancer patients themselves, to prove that nothing can stand in their way of overcoming the disease. Meet Julian Timothy Axon (58) who hails from Leeds, England, but who has been living in Port Elizabeth, South Africa for the past 40 years. Julian, or Jules as he is known, is married to his wife, Shelia Axon, and together, the couple has two beautiful daughters, Joni and Kerry. On all fronts, the Axon family appears to be the perfect family; however a closer look shows that not all is perfect. Jules has been living with cancer for the past 11 years, and it has not always been an easy road for him to traverse. Jules suffered from prostate cancer, and his diagnosis subsequently led to his prostate being removed. In May this year, Jules was diagnosed with a brain tumour that turned out to be brain cancer, and he needed an operation to remove the tumour. Since then, he has undergone a gruelling chemotherapy and radium treatment for the past six months. Just when his family thought their ordeal was over, Jules recently discovered he had malignant melanoma (skin cancer) and had to have a piece of his skin removed. How, you might ask, does this man see past through such trauma? Kerry, Jule’s youngest daughter said, “He is the most positive person on the planet. He has a famous saying: ‘Are you happy?’ He always asks us this, and reminds us to always see the positive side of every story. He is loving and caring, and if anything, these attributes have been enhanced since he was diagnosed with brain cancer”. Kerry said the reason why they took part in the walk is because, “We wanted to ‘beat’ cancer and finish the race in support of my dad, and for all the other cancer patients out there. We wanted to show everyone that even though cancer is tough, if you put your mind to something you can accomplish anything. The walk was extremely hard for my dad, bearing in mind that he is normally a fit 21km runner, but he still finished it”. A 27 member-strong group of close family friends who have supported Jules and his family through this trial-filled time all took part in the Big Walk. 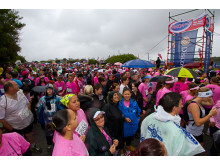 Going by the name, Team Jules, they all braved the storms in Port Elizabeth this weekend to complete the walk with Jules. Janine Howell, the group’s founder said, “Kerry Axon is my best friend, and this year she has had a lot to go through with regards to cancer. She has had to see her stepdad, mom and now her dad, Jules, all fight against cancer. So for her the words FIGHT hits really close to home”. Asked about Team Jules’ philosophy and why it was formed, Janine said, “Julian really wanted to do the walk, come rain or snow, to achieve something during his battle. He informed his youngest daughter Kerry who then arranged the family and friends to get some shirts and support him in his walk. It wasn’t difficult to rally people together as Jules is very popular and everyone wants to support him. The logo on the shirt represents the three different cancers that Julian has had - blue for prostrate cancer, grey for brain cancer and red for skin cancer”. This group, she said, “came about as a result of a need to create awareness about cancer, and to support Jules in achieving his goal of finishing the race”. Towards the end of the interview, Kerry shared some wise words. “People going through this trial and battling with cancer should remain positive and be consistent in whatever endeavour they engage themselves in; and in Jules’ words, “Be Happy!” at all times, for there is always somebody worse off, even if it doesn’t feel like it now,” she concluded.